The offered Binocular (BIO - 249102) is appreciated both for its excellent performance and classic look. 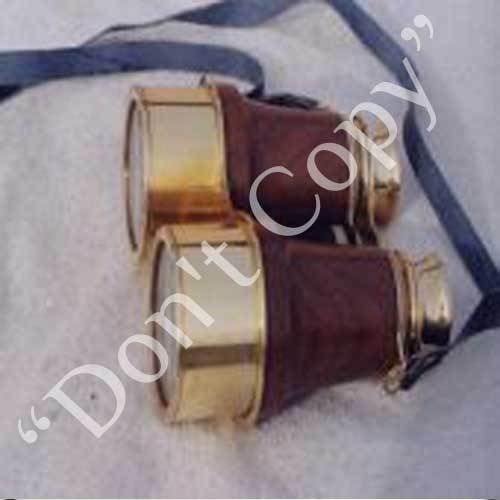 High quality lens, brass and wood casing are used in fabrication to give it a very different look. Rear lens for both, forward and backward, this binocular is highly dependable and can work for an extensive period with lacking of any dilemma. Known for its durability and excellent performance, clients can avail this binocular at market leading prices. Established in the year 1997 at Roorkee (Uttarakhand, India), MJR Exports, is involved in manufacturing and exporting a high quality assortment of historical old ward Armour helmets, armory, shields, swords and reproduction of brass nautical products, nautical clocks, diver helmet, fire helmets, gramophones and other similar products to our highly valued clients for Germany, England, Italy, Poland, Australia, New Zealand, USA. With the aid of an attentive team, we have earned the confidence of an extensive client by supplying them quality oriented products at the most feasible prices. The complete team is highly passionate about fabricating and supplying the highest quality products. Our automate and highly equipped manufacturing facility is equipped with the most modern of production machinery and personnel to fabricate an exclusive assortment of export quality products for our clients across a number of sectors in the economy.